"Leaning on the Everlasting Arms,"
This popular gospel hymn is also known as "What a Fellowship." Elisha A. Hoffman (1839-1929) wrote the stanza, and Anthony J. Showalter (1858-1924) wrote the refrain. Showalter also contributed the music. "Leaning on the Everlasting Arms" is the result of an epiphany based on the text of Deuteronomy 33:27, "The eternal God is thy refuge, and underneath are the everlasting arms" (KJV). Showalter was a musician who conducted singing schools. 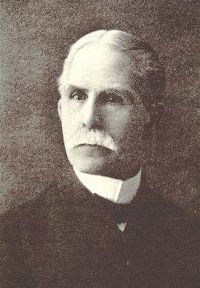 He studied music in England, France, and Germany and served as an elder of First Presbyterian Church in Dalton, Georgia. Showalter was inspired by this Scripture after hearing the news that the wives of two of his former pupils had died and were buried the same day. In a letter of sympathy, he created the refrain out of a verse from Deuteronomy and asked Hoffman to write the stanzas. According to hymnologist Carl P. Daw, Jr., it appears that the Baptist Hymnal (1956) appropriately assigned SHOWALTER as the tune name for this song (Daw, 2016, 799-800). After serving as a soldier for the Union Army, Elisha Hoffman attended Union Bible Seminary in New Berlin, Pennsylvania, and was ordained by the Evangelical Association in 1868. A pastor in Ohio, Michigan, and Illinois, he also worked with the publishing arm of the Evangelical Association in Cleveland, Ohio, and was the first music editor of Hope Publishing Company (1894-1912), a leading publisher of gospel songs. Hoffman composed more than 2,000 compositions and compiled nearly 50 songbooks and hymnals. "Leaning on the Everlasting Arms" was first published in 1887 in the Glad Evangel for Revival, Camp and Evangelistic Meeting Hymnal. Gospel song lovers will recognize other texts by Hoffman, including "Are You Washed in the Blood? ", "Down at the Cross," and "Is Your All on the Altar?" "Leaning on the Everlasting Arms" complements cultures that have roots in oral tradition, which makes the hymn easy to memorize. Specific characteristics include poetic devices such as epistrophe — repetition of a word or words at the end of lines or phrases. Notice that the words "Leaning on the everlasting arms" are repeated at the end of each phrase in each stanza. After singing all three stanzas and the refrain three times, the singer will repeat this key phrase nine times. The first stanza addresses the joy of God's presence. The hymn writer suggests that even in times of death, peace can be found. The second stanza compares the Christian faith to a pleasant pilgrimage. With the use of the first-person singular pronoun "I" in the third stanza, there is no confusion about who the speaker is. This hymn can become a personal testimony because of the use of "I" in the third stanza. While the stanzas do not specifically reference Christ, the refrain does when the lower voices sing, "leaning on Jesus." The original reference from Deuteronomy takes on a Christian character in the refrain and implies an intimate relationship with Jesus — the friend on whom one can lean. Even though the word “Lord” in the stanzas is ambiguous, the hymn is inherently Christological in its message. The African American tradition of syncopation, handclapping, and heavy use of percussive instruments enlivens this hymn and gives hymn lovers the freedom to embellish and improvise in worship. For a solo rendition by Mahalia Jackson (1911-1972), see https://www.youtube.com/watch?v=3Mb0XA2BDx0. "What a Fellowship" has become an icon of the gospel song. It was sung in the 1943 movie The Human Comedy, starring Mickey Rooney, a film that was nominated for Academy Awards in five categories, including Best Picture and Best Actor. Other films that included the hymn are The Night of the Hunter (1955), Phase IV (1974), Wild Bill (1995), Next of Kin (1989), True Grit (2010), and First Reformed (2017). The hymn formed a substantial portion of the musical score of True Grit. It has also been a part of numerous television episodes. Daw, Carl P., Jr. Glory to God: A Companion. Louisville: Westminster John Knox Press, 2016. Edward Gibson holds the Master of Sacred Music from Perkins School of Theology, Southern Methodist University, where he studied hymnology with Dr. C. Michael Hawn. He is currently Director of Music and Fine Arts Ministry at Christ United Methodist Church, The Woodlands, Texas.